SMASH Kitchen & Bar is ideal for functions ranging from 10 to 200 guests. We have 2 private dining rooms that can seat up to 30 comfortably & accommodate up to 40 for a cocktail reception. We are available for brunch, lunch and dinner bookings, 7 days a week. 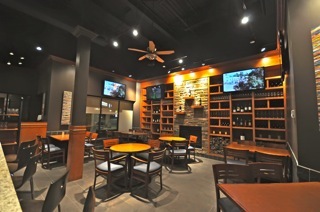 We also have a semi-private dining room that seats up to 30 and accommodates up to 35 for a cocktail reception. 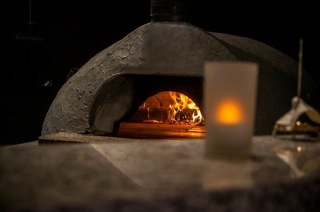 SMASH Kitchen & Bar offers an a la carte menu as well as several set menu ideas. We can also customize any menu to accommodate your specific needs. 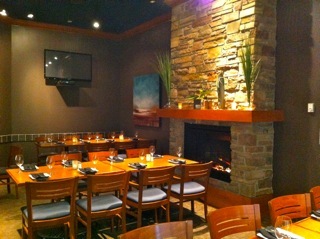 Our private dining rooms are outfitted with large screen TVs and can be adapted for presentations. Smash also offers complimentary WIFI. The Fireplace can accommodate up to 32 guests for a seated event and up to 40 for a cocktail reception. Click here to view Virtual Tour of The Fireplace Room! The Den can seat up to 10 guests comfortably. Click here to view Virtual Tour of The Den! The Semi-Private Dining room can accommodate up 28 guests seated comfortably, and 35 guests for a cocktail reception. Click here to view the Virtual Tour of The Semi-Private Room! The restaurant is also available for full buy-out. We can seat up to 160 guests and accommodate up to 250 for a cocktail reception. The guaranteed number of guests attending the function is required 2 Weeks in advance. Our private dining rooms, the Fireplace & the Den are outfitted with large screen TVs and can be adapted for presentations. Smash also offers complimentary WIFI. For your group reservation of 8 or more, please complete our inquiry form below. For immediate assistance, please call the restaurant at (905) 940 - 2000. Please note a deposit or rental fee may be required for larger events. *Please note, by filling out this form, it does not guarantee or confirm your reservation. We will get back to you within 48 hours of your inquiry. Thank you.